> DMC Coton à Broder No. 25 > DMC Medici wool. 778 pale clover pink, 779 brown, 967 pale salmon, 861 pinkish donkey. Color Variations is a new DMC Stranded thread that offers you a wide range of colours in only one skein. 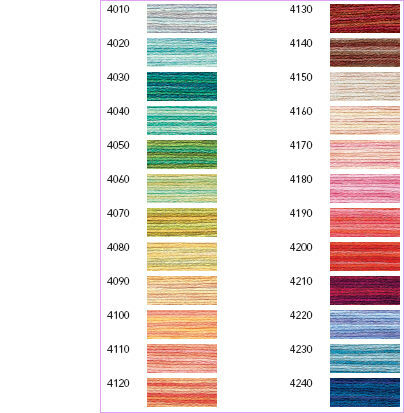 Every 6 to 7 stitches, each thread from the DMC Color Variations line reveals a succession of colour changes, which are unique on each needlework project. In soft multi-colored or tone-on-tone shades, these 24 new threads present the same stitching quality as DMC Stranded cotton. Now on sale here for 97p per skein. Books of attractive designs, one of flowers and one of fruit designs using the Color variations thread are also available from us price £2.99. See DMC shade card W100 NC. A very brilliant, slightly twisted mercerised thread, available in a variety of sizes. We like to use it instead of stranded for a neater, non-splitting finish which isn't affected by washing. Essential for Hardanger, blackwork, pulled work; superb on canvas and has masses of other uses where a defined, twisted shiny thread is required. DMC seems to be changing the make-up of DMC No. 5 on an ad hoc basis. In response to demand, we are expanding our stocks of No. 5 as local shops are reducing theirs. If your particular colour is not in stock we can get it in about a week. Tell us how much thread you need, so that we can get the right quantity regardless of whether it is sold in skeins or balls. Approx. 250 colours. See DMC shade card D107W. A semi-matt finished embroidery thread made from 100% Californian combed cotton. We can order complete boxes of 12 skeins of any colour of coton à broder. 3 colours stocked: white, ecru and black.